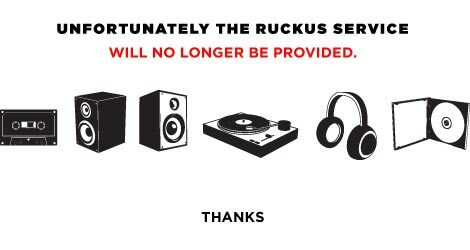 Ruckus, an online music service geared towards universities that allows students to stream an unlimited amount of music, has apparently just closed its doors. The service was designed to appeal to college students, offering a legal alternative to the piracy that can be found on many campuses. Ruckus was initially offered as a subscription service, then eventually moved to an ad-supported model with partnerships with dozens of major universities. Eventually it opened to all students with an accepted university email address (typically .edu). At around 5 PM EST today the site went down with a notice stating that it was undergoing an update. As of 5:30, it was displaying the shutdown notice seen above. We’re told that music that has not passed its “renew date” still works, but that music that has expired will no longer work because the DRM licensing server has apparently shut down. Last year Ruckus was acquired by Total Music, the joint venture between Sony and UMG, with the intention of using it as a backend for a service which still has yet to launch. Total Music has been struggling for some time – we hear that it made a strong pitch to provide Facebook’s music service, but that it was eventually denied when the social network was unwilling to share revenue and user data, which would have been part of the deal (Total Music was also unable to get Warner, the last major label holdout, to agree to participate in the venture). While Ruckus’ closure certainly doesn’t bode well for the initiative, Total Music doesn’t seem dead quite yet. Last month it quietly launched a site called Tunepost in private beta, which seems to offer streaming music through a widget.